Nashville performers are coming to Brookhaven for a weekend to entertain! Brothers, Steven and Jason Nix, are currently Nashville performers bringing their talent to downtown Brookhaven. Opening for them Friday are Tony Norton, Eric Woods and Sophie Smith. On Saturday, they’ll have Tyler Bridge, Gabriel Bass and Michael McCall starting the show. The Nix brothers will each play songs they’ve written that will be recognized from radio, but they’ll mix it up with songs that have meaning for them whether they wrote them or not. They’ll take requests, too, which will make each night a bit different. 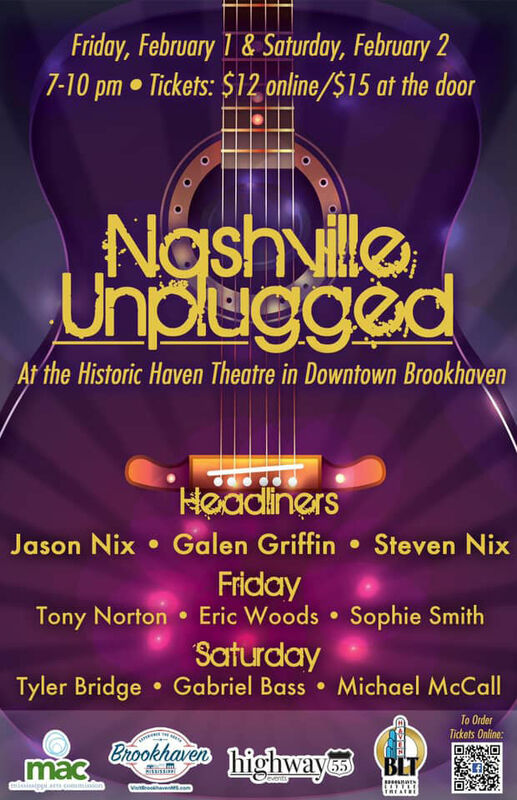 Nashville Unplugged will be performing at the Brookhaven Little Theatre on Friday, February 1st and Saturday, February 2nd beginning at 7pm. Each night is $15 at the door or $12 and $1.60 fee online at www.highway55events.ticketleap.com.